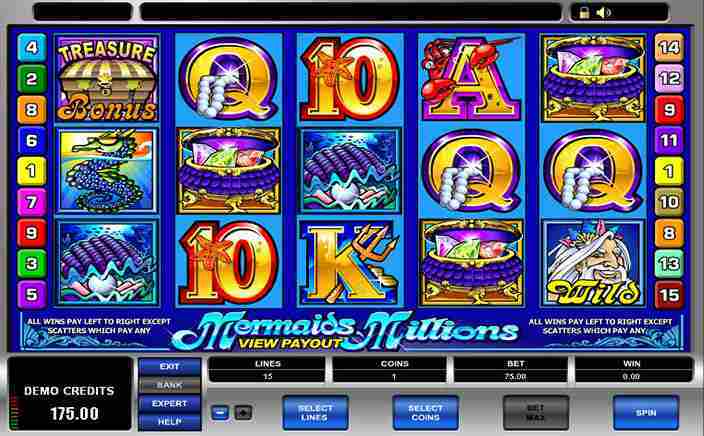 Mermaids Millions slots is a 5 reel game played with 10 paylines and 5 coin levels. The theme of magical underwater with the mermaid and her father Neptune is set in the backdrop of a blue screen with fishes moving in circles. The gushing sounds of water pressure make you feel you are underwater yourself and there are random music tones played when the reels spin. It is fast paced so you do not have to wait for long to see how much you have won. You can bet as low as £0.01 or you can increase your bet up to £75 per spin to include all paylines and all 5 coins levels. This awe-inspiring slots game was developed by Microgaming, a gaming company with over two decades of experience creating a variety of slot and other casino games for both online and live casinos. You get to experience new games from them every month and that has really kept them on top of the list. Mermaids Millions slots have three high-value symbols, to begin with, and they are a pot with gems and jewels, a seahorse with shades on and a sea shell with a pearl inside. Playing card symbols from 10 to A are the low-value symbols that appear more frequently. There are three bonus features represented by symbols of a beautiful mermaid princess, his father Neptune who is the king and a closed chest of treasure. All wins are paid from left to right during a spin. ● Bonus Features: There are wild and scatter represented by Neptune and his daughter mermaid princess respectively. Wild covers for all except scatter and treasure chest symbols and even offers 7500 times the stake on your bet when five wilds appear on an active payline. You can win 10 free spins with three or more landings of mermaid scatter symbol. The best part is that all your wins are tripled during free spins and there are chances of winning more free spins too. ● Treasure Bonus Game: This is a bonus level of Mermaids Millions slots and three or more closed treasure symbol landings unlocks the game. This is a pick and win type of game where you pick between three and five symbols of chests, barrels and sea shells. The number of chances you get depends on a number of bonus symbol landings in the slot. With pick & win you can win anywhere from 36 to 2500 times your bet. 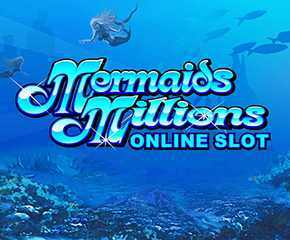 With lots of free spins and a bonus game where you can win huge stakes of money, Mermaids Millions slots is a game you must not miss if you want to win real money.